Harry Potter- Snogging, Valentines, and Romance. Do you like Harry Potter and reading about snogging? Then this is the post for you! Here I have compiled some of the best valentine, romance, and snogging based moments from the books. All quotes from J.K. Rowling's Harry Potter books, obv. Let me know your fave Harry P snogging scenes! Happy Valentine's Day! Snogging! Harry would have given all the gold in Gringotts to evaporate on the spot. Trying valiantly to laugh along with everyone else, he got up, his feet numb from the weight of the dwarf, as Percy Weasley did his best to disperse the crowd, some of whom were crying with mirth." "They were almost at King's Cross when Harry remembered something. Fred dropped a stack of books on George's head. 'It's that Ravenclaw Prefect, Penelope Clearwater,' said Ginny. 'That's who he was writing to all last summer. He's been meeting her all over the school in secret. I walked in on them kissing in an empty classroom one day. He was so upset when she was- you know- attacked. You won't tease him, will you?' she added anxiously. 'Wouldn't dream of it,' said Fred, who was looking as if his birthday had come early. 'Definitely not,' said George, sniggering. 'Well, you'd better hurry up, mate, or all the good ones will be gone,' said Fred. 'Who're you going with, then?' said Ron. 'Angelina,' said Fred promptly, without a trace of embarrassment. Angelina, who had been chatting to Alicia Spinnet near the fire, looked over at him. Angelina gave Fred an appraising sort of look. 'All right, then,' she said, and she turned back to Alicia and carried on chatting, with a bit of a grin on her face. 'There you go,' said Fred to Harry and Ron, 'piece of cake.'" 'Did you kiss?' asked Hermione briskly. Ron sat up so fast he sent his ink bottle flying all over the rug. Disregarding this completely, he stared avidly at Harry. Harry looked from Ron's expression of mingled curiosity and hilarity to Hermione's slight frown, and nodded. Ron made a triumphant gesture with his fist and went into a raucous peal of laughter that made several timid-looking second-years over beside the window jump. A reluctant grin spread over Harry's face as he watched Ron rolling around on the hearthrug. Hermione gave Ron a look of deep disgust and returned to her letter. Harry considered for a moment. "'Oh, there's a really nice place up here; haven't you ever been to Madam Puddifoot's?' she said brightly, leading him up a side road and into a small teashop that Harry had never noticed before. It was a cramped, steamy little place where everything seemed to have been decorated with frills or bows. Harry was reminded unpleasantly of Umbridge's office. 'Cute, isn't it?' said Cho happily. 'Er... yeah,' said Harry untruthfully. 'Look, she's decorated it for Valentine's Day!' said Cho, indicating a number of golden cherubs that were hovering over each of the small, circular tables, occasionally throwing pink confetti over the occupants." "Harry looked into the corner she was indicating. There in full view of the whole room, stood Ron wrapped so closely around Lavender Brown it was hard to tell whose hands were whose. She patted him on the arm; Harry felt a swooping sensation in his stomach, but then she walked off to help herself to more Butterbeer." "'Romilda Vane,' said Ron softly, and his whole face seemed to illuminate as he said it, as though hit by a ray of purest sunlight. 'I think... Harry, I think I love her,' said Ron in a strangled voice. He turned to leave, he got two steps towards the door when a crashing blow hit him on the right ear. Staggering, he looked round. Ron's fist was drawn right back, his face contorted with rage, he was about to strike again." "Harry looked around; there was Ginny running towards him; she had a hard, blazing look in her face as she threw her arms around him. And without thinking, without planning it, without worrying about the fact that fifty people were watching, Harry kissed her. The creature in his chest roaring in triumph, Harry grinned down at Ginny and gestured wordlessly out of the portrait hole. A long walk in the grounds seemed indicated, during which- if they had time- they might discuss the match." 'I know, mate,' said Ron, who looked as though he has recently been hit on the back of the head with a Bludger, 'so it's now or never, isn't it?'" See You in the Cosmos by Jack Cheng is strange and funny and moving story told in the transcriptions of voice recordings 11-year-old Alex Petroski makes on an iPod he intends to send to space on the rocket he has built and will launch at a rocket convention. His unexpected journey takes him from Colorado to New Mexico to Las Vegas to L.A. and back Colorado again. Alex's father died many years ago, his older brother works far away and checks in rarely, and his mum has been having a lot of her 'quiet days' recently. Alex can cook pretty well for himself and his mum, and has plenty of friends on Rocketforum, where he has learned all his rocket-building skills. With his pocket money from his job at a nearby grocery store Alex has ordered all his rocket parts online and booked his Amtrak tickets from Colorado to New Mexico. What ensues is a surprising amount of travel and road tripping for an 11 year old on his own, with a lively cast of supporting characters/grown ups. The transcripts of Alex's voice recordings work really well as a storytelling tool, especially in tense situations with Alex narrating. Alex absolutely melts your heart leaving you rooting for him and of course his faithful doggo, Carl Sagan. See You in the Cosmos is out on March 2nd 2017! I received a copy of this book from the publisher in return for an honest review. All views my own, promise! Well hello there and welcome to my January reading round up! I had a good variety of books and graphic novels and audio books and short stories this month. When it was still just after Christmas time and I was still on holiday, I read I'll Be Home for Christmas, the short story collection from Stripes Publishing with proceeds going towards Crisis, the national homelessness charity. With stories on the theme of 'home' from writers including Holly Bourne, Non Pratt, Julie Mayhew, Lisa Williamson, Juno Dawson, this YA collection is an excellent festive treat. Maybe save it for next winter if you haven't read it yet! 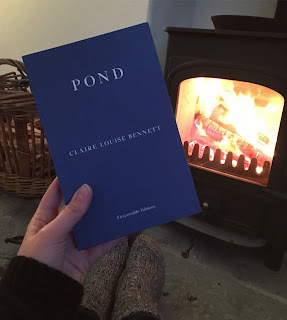 Next up I read Pond by Claire-Louise Bennett from the Fitzcarraldo Editions. This is the first I've read from these lovely blue editions, and was a Christmas present from my best pal, and I enjoyed it very much. It's another collection of short stories/essays sort of about nothing but also everything, and I will be keeping it near at all times to use as a thesaurus because Claire-Louise Bennett's vocabulary is extensive and lyrical and extremely envious. I had a middle grade review copy on my to be read pile crying out to be read- See You in the Cosmos by Jack Cheng. This strange and funny and moving story is told in the transcriptions of voice recordings 11-year-old Alex Petroski makes on an iPod he intends to send to space on the rocket he has built and will launch at a rocket convention. His unexpected journey takes him from Colorado to New Mexico to Las Vegas to L.A. and back Colorado again. I finally read Isabel Greenberg's The One Hundred Nights of Hero, the follow up graphic novel to The Encyclopedia of Early Earth, which I loved. 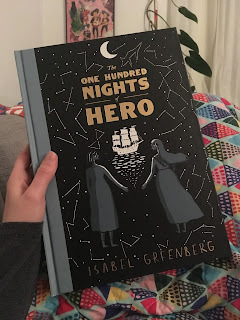 The One Hundred Nights did not disappoint, with fantastical stories of from the world of Early Earth woven together into one beautiful tale of resistance and cunning. As always, the artwork is wonderful. In audiobooks, this month I listened to Hannah Hart's Buffering, which chronicles Hannah's life and childhood up to her current success as a YouTube creator. I knew a little of Hannah's story from watching her videos, but HOLY MOLY has her life been crazy, which has led to an extremely compelling set of essays. Growing up with a schizophrenic mother, a Jehovah's Witness father, and being in the closet until a couple years into college, Hannah has not had an easy life. She's a natural writer, and I really recommend the audiobook read by Hannah herself. 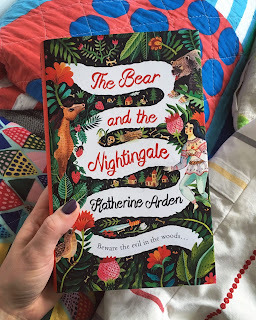 I preordered The Bear and the Nightingale and it arrived in time for my birthday in the middle of the month. I saw the beautiful cover and so many twitter recommendations and read the blurb and it was a done deal. Based on Russian folk stories in a snowy winter setting, this was the perfect January read. To round off the month I read some more short stories, this time by Jessie Greengrass. An Account of the Decline of the Great Auk, According to One Who Saw It, is the title of the collection and the first story. As it was apparently a Foulis who killed one of the last Great Auks I have a particular interest so the title totally drew me in. The stories were varied and interesting and I'm looking forward to what Jessie Greengrass writes next! Full reviews of a couple of these coming soon!